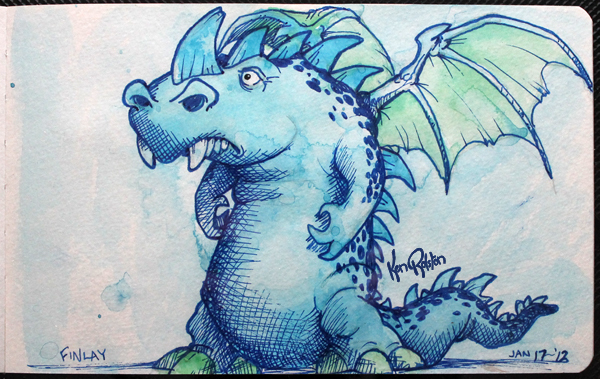 Dragon 263 – More fun with the watercolour sketchbook! This dragon kind of looks like a dragon crossed with a coypu! ***I posted this picture late last night, I didn’t have enough time to write much, so I thought I would add a bit this morning. I’m sorry for not getting any photos posted this past weekend. My wife and I decided that we were finally going to celebrate our ‘Christmas’ this weekend. So I took some time to just be with her, no work, no internet. Why do we celebrate our Christmas in January? Well, there’s all kinds of reasons for that. From my side, I come from a big family. Anything under 25 people at Christmas dinner is considered a small Christmas…which can be a little overwhelming for anyone that didn’t grow up with those numbers. From my wife’s side, it’s her mom’s birthday on Christmas day, so they usually do their own thing, a smaller dinner, some hiking, time together. Then we follow Christmas up with New Year’s, a friend’s birthday in the first week of January, by the time things settle back down to where we can have a peaceful weekend to relax…it’s almost February. In fact, we’ve gone as late as February in some years before having our little weekend. So forgive me for not posting this past weekend, I should be back to my regular photo posts next weekend.